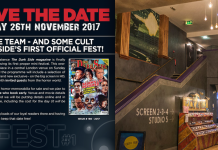 As I’ve already mentioned, our Hammer issue was our biggest-selling one to date, so there are obviously lots of you out there who still appreciate Britain’s oldest and most iconic horror studio. 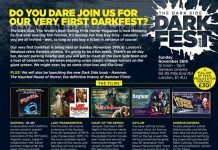 Hammer completists will also note that the new issue of The Dark Side, in shops now, contains an ad for Hammer Films On Location, a new book from Peveril Publishing which tells you where all your favourite Hammer films were shot. I’ve always loved stuff like this. I remember going on holiday to Yarmouth many years back and taking a day trip to visit Lavenham, where many of Witchfinder General’s witch-burning scenes were filmed, and I’ve always loved the fact that The Ghost Train was partly shot at Liskeard station, Liskeard being where we originally produced The Dark Side. 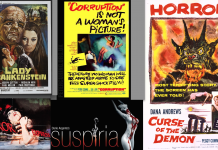 Hammer Films On Location is a real treasure trove for trainspotting genre fans and it has been put together with tremendous love and care, with pictures of the old locations alongside how they look today. Many of Hammer’s movies were filmed at Black Park in Buckinghamshire, on the fringes of Pinewood Studios, and also familiar to fans are the creepy mansions of Oakley Court and Down Place. But this book goes above and beyond the call of duty to pinpoint many lesser-known locations. For example, X The Unknown was filmed in some gravel pits at Gerrard’s Cross, near Bray Studios in Windsor, and the chemists (The Woods of Windsor on Charlotte Street) visited by the mutating Richard Wordsworth in The Quatermass Xperiment still looks pretty much the same today. The opening scenes involving the rocket crash in that movie were filmed in the fields near Bray studios, and the Crown pub visible in the opening scenes is now owned by celebrity chef Heston Blumenthal. Chessington Zoo was another stop on the monster’s way to Westminster Abbey, though nowadays it’s Chessington World of Adventures and the animals play second fiddle to theme park rides. Many of the locations have changed beyond recognition of course, and others are on private land, but there are still plenty of them that will be worth the pilgrimage for those who worship at the altar of Hammer Horror. In this respect the book is an essential purchase for Hammer fans, and writers Wayne Kinsey and Gordon Thomson are to be congratulated on the awesome effort they have put in. Check it out at www.peverilpublishing.co.uk. 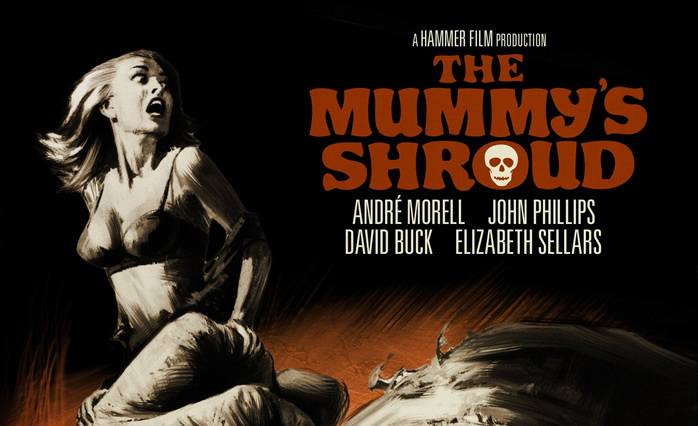 Hammer buffs won’t have to wait long now for the Blu-rays of The Mummy’s Shroud, Rasputin, The Mad Monk and The Devil Rides Out, all released in October by StudioCanal. Devil is the best movie in the bunch by far, but I still have a soft spot, probably between my ears, for The Mummy’s Shroud, because it was the first Hammer flick I ever saw in a cinema. I bet the HD scrub-up doesn’t do any favours for the unconvincing sand pit desert, however. On the Blu-ray front, the most eagerly awaited Hammer title so far is surely Lionsgate’s 15th October release of The Curse of Frankenstein. This amazing 3-disc set contains a DVD version as well and features the Hammer classic fully restored in High Definition and for the first time in its original Academy ratio of 1.37:1. This version also includes the infamous “eyeball” scene, which was originally censored but has now been fully restored. As well as an alternate version of the feature at the widescreen ratio of 1.66:1, the release also includes brand new documentaries and commentary track, multiple bonus extras and a stills show. Extras include a new audio commentary by Hammer historians Marcus Hearn and Jonathan Rigby, Frankenstein Reborn: The Making Of A Hammer Classic (a brand new documentary), and Life With Sir (new and exclusive Peter Cushing documentary). In addition we get Terence Fisher’s 1953 sci-fi movie, Four Sided Triangle, the 25-minute TV pilot for Hammer’s short-lived Tales Of Frankenstein show and an episode of The World Of Hammer on The Curse Of Frankenstein. The packaging looks gorgeous too. Can’t wait to give this a spin! Finally, I’d just like to point out a mistake in one of my reviews in issue 149. I omitted to mention that The Blood Beast Terror Blu-ray from Redemption is Region A coded, which means it won’t play on UK machines unless they are multi-region. Never fear though, because as Marc Morris pointed out to me at this year’s FrightFest, Odeon Entertainment are releasing the same transfer on BD on 22nd October, and it will have some nice juicy extras too.